Xerox WorkCentre 5325 Multifunction printer are perfect for businesses or workplaces that deliver speed and productivity. This printer can scan, copy, send faxes, and print all from the same machine, and produce excellent results while doing so. 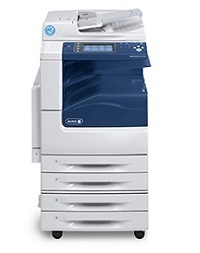 Xerox WorkCentre 5325 has a body measuring 597 x 637.5 x 1,115mm and weighs approximately 100kg. The MFP also has a very clear and easy-to-read 7-inch color LCD display that helps the user to easily navigate the various functions of the printer, in addition to the more traditional push-button push control panel. Download the Xerox WorkCentre 5325 driver according to the Operating System on your PC or laptop at the link below.